So I scanned the entire poster list for today and of course still managed to miss TONS of interesting stuff, I now realize when chatting with colleagues. What I did notice, though, was that there are some nifty ACC experiments in the social/reward realm, which was quite new to me. I stopped by Bryden et al.’s ‘Activity in anterior cingulate cortex increases on behavioral traits after reward contingencies unexpectedly change’. That was pretty interesting, to do with reward flexibility, etc. I was also super impressed with Bliss-Moreau et al.’s ACC lesion study in rhesus macaques. She found that ACC-lesioned animals initiated social contact less and showed fewer dominance behaviors with conspecifics and had lower mating behaviors. Her poster was so crowded I didn’t even get a chance to have a chat! 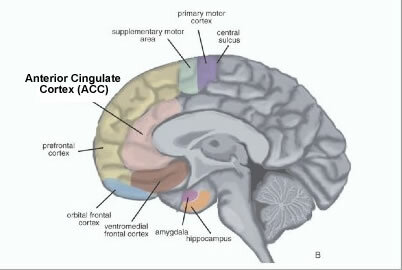 I found some cingulate effects recently so I’ll have to have a good think about this finding. Did you guys see any other cool ACC posters today?